Hope everyone had a happy Halloween. And didn't dip into the candies too much. 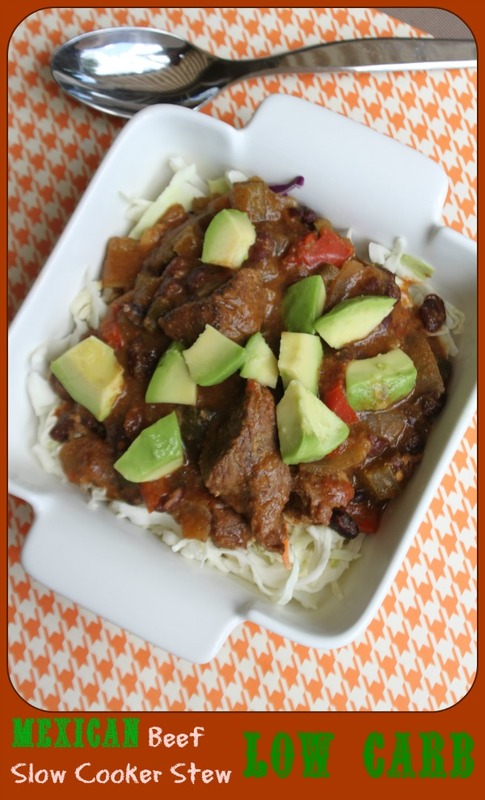 If you did then here is a nice clean and low carb recipe you can make to redeem yourself. I, myself, haven't been cooking much this week. Too busy with Halloween baking, etc, etc. Problem is that when I don't eat tasty, clean meals I start looking for treats to keep me satisfied. So I gotta get organized and back in the kitchen this weekend. And make myself some hearty and healthy main dishes that will keep my hands out of the cookie jar! Combine coconut flour, garlic powder, onion powder, salt and pepper in a shallow pan. Dredge beef cubes through coconut flour. Fry beef in olive oil until browned on all side. About 5 minutes. Place all other ingredients, except coconut milk and arrowroot, in slow cooker and mix thoroughly. Place browned beef on top. Cook on low heat for 6 hours or on high for 3 hours. Approximately 1/2 hour before serving, combine coconut milk and arrowroot, and then mix it into beef stew. Slow cook for an additional 1/2 hour on high. Serve topped with fresh avocado, green onions and/or diced tomato.